This is my "brother", Matouk. He's my dad's wolfdog; Or, I could say my dad is Matouk's human, because they both spend a lot of time training each other. In fact, I'm not sure who has been trained more. Wanna know the title of the book? I thought you were going to say the title was "Women Who Run with Wolves". What a handsome boy. Misty, love this photo! Seems our companions, whether dog or cat are all the same when it comes to stealing our chairs! I believe you, I have many shots of the cat that are not set up! A wonderful wonderful looking doggie! So similar to Freida who is sitting next to me here! But, of course, dogs are so human. He's probably been reading your book on the sly and can't wait to see how it ends! Great story and you've taught him to read, amazing! My friend has one namedspirit How very wise they look and are !! "A dog is a man's best friend", as the saying goes.Your dad is lucky to have such an adorable wolfdog as a companion. 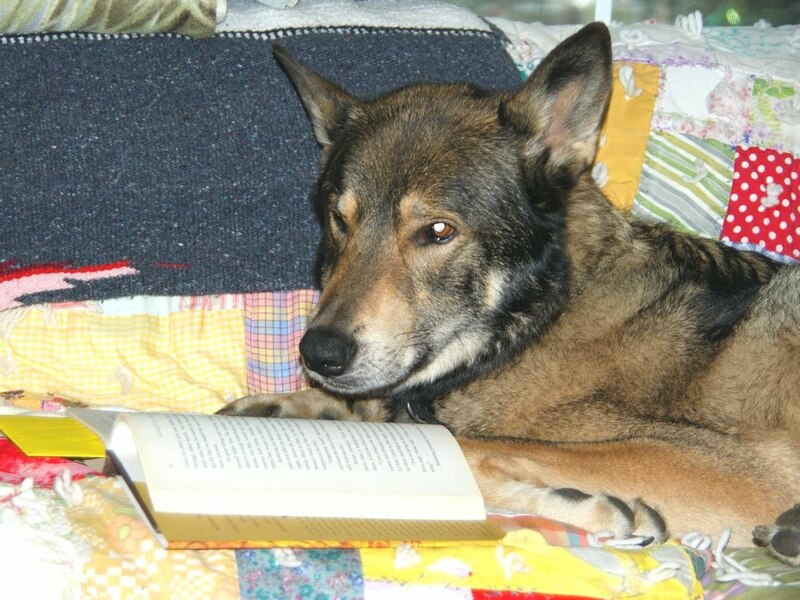 Matouk had to be pretending to sleep in the bed, waiting for the moment he could steal your spot and continue reading. Wow, Misty Dawn, that is a photo that could go on a calendar. I hope you are planning on printing and framing it. I love it! How cool that he turned the pages with his paws. He is one smart critter. I can't remember how much wolf is in Matouk. I'm thinking one of his parents was a wolf; is that right? What a clever dog! I'm not at all surprised...I always say that we don't give animals enough credit for being smart. They can be simply amazing. And you are probably right...Matouk has probably trained your dad just a much as you dad has trained Matour. Funny pic! :-) He looks so nice.